The aesthetic appeal and health of your teeth can have a positive or a negative effect on your confidence. Your first impression at a social event or in the workplace is often associated with your smile, which makes it hard to network or go on a date when you avoid grinning because of embarrassment. Chipped, cracked, or missing teeth impact much more than your aesthetic concerns. They also pose significant threats to your oral health, putting your existing, healthy teeth in danger of decay, disease, and tooth loss. Dental crowns and bridges are a great way to restore your teeth, giving you full functionality and cosmetic charm. If you struggle with damaged or missing teeth, please contact Highpoint Dental Care in Aurora today at 303-617-9100 to schedule your dental exam and consultation. Our restorative and cosmetic dentists serve patients in the Aurora, Colorado, area including Green Valley Ranch, Parker, and Centennial. How Is the Crown or Bridge Procedure Performed? How Can I Prepare for a Crown or Bridge? Can I Combine a Crown or Bridge with Another Procedure? 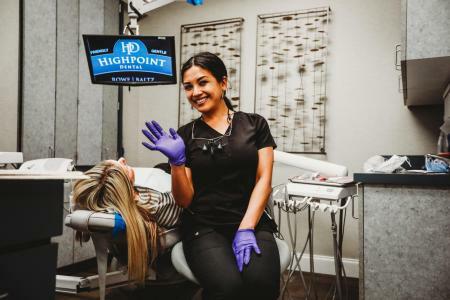 Why Choose Highpoint Dental Care? A dental crown is a cap made out of ceramic and/or metal that encompasses your entire tooth. Crowns are typically utilized when you have a damaged tooth or cosmetic issue. However, cosmetic flaws may also be corrected with porcelain veneers, which are thin shells that cover the front portion of your tooth. The chosen material for your dental crown will depend on the location of the tooth. Dr. Baltz and Dr. Rowe typically recommend using a metal crown for back teeth and ceramic on front teeth. Ceramic-on-metal crowns are also an option and have the added benefit of looking natural with the optimal durability of the metal. Crowns are excellent for patients who have severe tooth sensitivity, significant tooth cracks and chips, or have undergone a root canal. We recommend crowns for those with an active lifestyle who don’t want to worry about loose dentures and don’t want dental implants. A dental bridge utilizes two crowns that act as a “bridge” for the gap left from a missing tooth. Tooth loss can occur for a variety of reasons such as age, injury, and poor oral hygiene. Advanced gum disease is another leading cause of missing teeth. Our cosmetic dentists recommend a bridge when you don’t want dentures, which can come loose when talking or eating, and don’t have the means or time necessary for implant surgery for dental implants. Dental bridges typically involve ceramic or porcelain crowns that are created to match the shade of your existing teeth. The anchor crowns on either side hold the bridge in place, which has a gum-looking piece that keeps the artificial tooth in place and gives a natural appearance to the synthetic bridge securing the new tooth in place. Dental bridges can improve oral health, and provide optimal functionality. They are durable and allow you to speak, eat, and drink normally. We have an E4D scanning and milling machine at our Aurora dental office for same day crowns. This device gives our dentists the ability to prep and deliver crowns during the same appointment – a service that many dental offices don't have. You will be able to leave your appointment with a permanent crown, with no need for temporaries or a second visit. Getting a crown or bridge begins with a thorough exam and consultation. We offer free consultations to patients undergoing advanced dental services such as crowns, bridges, smile makeovers, and other cosmetic dentistry options. During your initial appointment, Dr. Rowe or Dr. Baltz will inspect your teeth, gums, jawbone, and overall state of your mouth. It’s important to identify gum disease and tooth decay first so we can address those issues before moving forward with your crown or bridge. Once we’ve established you have good oral health and discussed the cosmetic imperfections bothering you, we’ll develop a treatment plan for your needs based on your goals and what we discovered during the exam. When it comes to dental crowns and bridges, a cosmetic dentist such as Dr. Rowe or Dr. Baltz is the most qualified to give you your desired results. We’ll begin the procedure by taking an impression of your teeth, which will be used to create the restoration in our dental lab. Your teeth need to be prepared for the placement, so the top layer of your tooth (enamel) is reduced to make room for the crowns. That way we don’t have to push your adjacent teeth out of alignment. When dealing with a bridge, two crowns are placed on the teeth adjacent to the gap left by the missing tooth and the synthetic bridge takes the place of the lost tooth. That allows for a durable new tooth that appears natural and functions just like your natural teeth. Our dentists will tell you what steps you can take to prepare for your crown or bridge process. It’s recommended you ask for at least one day off of work because tooth sensitivity is common. A few days off of work combined with over-the-counter pain medication gives your mouth the best opportunity to recover, especially if your job involves a lot of speaking. The recovery from dental crowns or bridges is minimal. As we mentioned above, sensitivity is common due to the enamel reduction involved within the process. You can use over-the-counter medications to cope with any discomfort. Make sure to discuss the oral pain medication you’re taking with our dentists to make sure you’re using the best option with the least side effects. Dental crowns and bridges can be done in conjunction with other cosmetic procedures. Teeth whitening is the most common, and it’s essential to brighten your smile before you start the crown or bridge process. The ceramic and porcelain materials used are created to match the shade of your adjacent teeth. They are stain-resistant and don’t respond to bleaching. Therefore, you must whiten your teeth beforehand or face yellowish or discolored crowns. This will cause problems if you decide to try teeth whitening later on. It’s best to start with a brighter smile that in turn comes with a brighter dental crown. Smile Makeover: The correction of several cosmetic flaws at once with treatments and procedures such as teeth whitening, crowns, and composite fillings. Porcelain Veneers: Veneers are similar to crowns but are mainly used for cosmetic purposes. They are porcelain shells customized to your tooth to address chips, cracks, deep discoloration, and crooked teeth. Lumineers are a similar option, but unlike veneers and crowns, they require little to no enamel reduction and can be removed if necessary. Dental Implants: Dental implants are used for cosmetic and restorative reasons. They’re not used in conjunction with a bridge, though, because an implant completely replaces missing teeth without the need for crowns on the adjacent teeth. Dental implants create an artificial root system within your jawbone using a metal post and a crown is screwed on top of it. Composite Fillings: Many patients choose to replace old amalgam (combination of metals) fillings with tooth-colored composite ones. We specialize in cosmetic and restorative dentistry at Highpoint Dental Care. We believe in listening to you and identifying the best way to reach your aesthetic goals while also ensuring optimal oral health. Dr. Baltz and Dr. Rowe provide a fun and welcoming environment that eases your anxiety or discomfort in the dentist’s chair. We are a kid-friendly family dentistry office that delivers an array of dental services for patients of all ages. We are a family-oriented dentistry practice that serves, at times, multiple generations of the same family. Trusted and experienced, Dr. Rowe and Dr. Baltz have taken time and made great effort towards creating a practice that is equal parts technologically advanced, warm and welcoming. We are uncompromising in our commitments to patient care and satisfaction, as well as to the fabrication and placement of the highest quality crowns and dental bridges. Our office offers nearly all procedures and treatments in-house, making it easy for you to have extensive dental procedures done without going to a second location for your dental work. Whether you come in for a routine checkup or a cosmetic consultation, our skilled staff and dentists will make sure you leave with a clean smile and a plan for improving your oral health and aesthetic concerns. 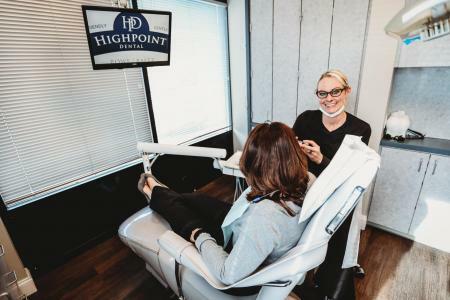 If you’re interested in dental crowns or bridges, please contact Highpoint Dental Care in Aurora, Colorado today at 303-617-9100 to schedule your exam or consultation. Drs. 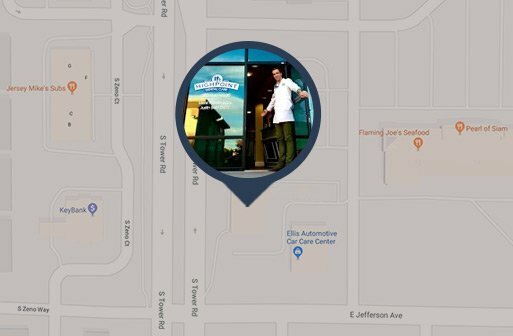 Rowe and Baltz serve patients in surrounding Colorado areas including Parker, Centennial, and Green Valley Ranch.